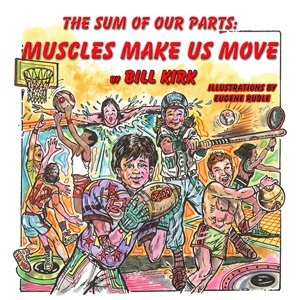 Bill Kirk’s The Sum of our Parts series continues with Muscles Make Us Move. In Kirk’s rhyming series of books that help youngsters learn about their bodies, this new installment focuses on the part of the body that help us move–muscles. From abductors to hamstrings, from pectoralis major to triceps, and more, we couldn’t do all we need to do without the more than 630 muscles in our bodies. Muscles Make Us Move takes a funny look at the major muscles, helping kids learn while being entertained. I reviewed an earlier book in this series, No Bones About It, in 2009. I immediately fell in love with Kirk’s witty rhymes coupled with the unique, and sometimes zany, illustrations provided by Eugene Ruble. Together, these men create a book that makes young people want to learn about a subject they might find boring otherwise. Every elementary science classroom studying the body should have a copy of each of The Sum of our Parts books. With Muscles Make Us Move, Kirk and Ruble continue to offer young readers a book that contains silly rhymes, factoids, word quests, and a glossary, all complemented by fabulous and funny artwork. I hope these men continue to collaborate. They always deliver a winner! I received a free PDF of this book from the author in exchange for my honest opinions. I received no monetary compensation of any kind to provide this review. The Tweet for Literacy Giveaway is a campaign designed to raise awareness of the importance of involving the whole family in a child’s reading activities. Tweet for Literacy will be giving away literacy-related prizes every two days throughout the month of November in honor of National Family Literacy Month. Help a child to read, and let the fun begin! Step 1: Follow our 7 sponsors on Twitter. This step is required. We will all follow you back! Step 2: Re-tweet (RT) any post about the giveaway. Use the hashtag #Tweet4Lit on each RT. Be sure to add the bit.ly URL link for this contest page. It’s . Step 3: That’s it! See the Official Rules below. You can re-enter as many times as you like. Prizes are awarded every 2 days starting on November 8. First day to enter is November 6, 2009. Last day to enter is November 30. A prize package will be awarded on each even day of the month. Each prize package will be a set of items that are literacy related. See below for specific information on prizes. The name of the winner will be selected at random and will be drawn at approximately 6pm CT. The winner will have 3 days to respond. If we don’t hear from the winner, we will select another winner for that prize package. We will notify our 13 winners by Direct Message (DM) on Twitter. Whereas you can enter as often as you like, if you are not following all 7 sponsors on Twitter, which will be verified, your entries will be disqualified. All entries that comply with the above rules will be valid for each drawing, including the Grand Prize. The Grand Prize will be awarded on December 1, 2009. Open to residents of the U.S. only. Must be at least 18 years old to enter. If you have any questions or comments about the giveaway, please contact Linda Thieman at blog (at) katieandkimble (dot) com. Our goal is to empower children and teens, especially girls, who are so often overlooked. We also seek to teach tolerance and self-acceptance through reading and through family interaction. Our first prize package winner will be selected on November 8, 2009, at 6pm CT.
Plus, Aurora of the Northern Lights by Holly Hardin (autographed — an $18.95 value), the delightful Christmas-themed picture book by one of our Tweet for Literacy sponsors. Check back here daily as we will continue to update the list of prizes. This rhyming book to help children learn more about their bones takes the dull art of learning and turns it into fun. 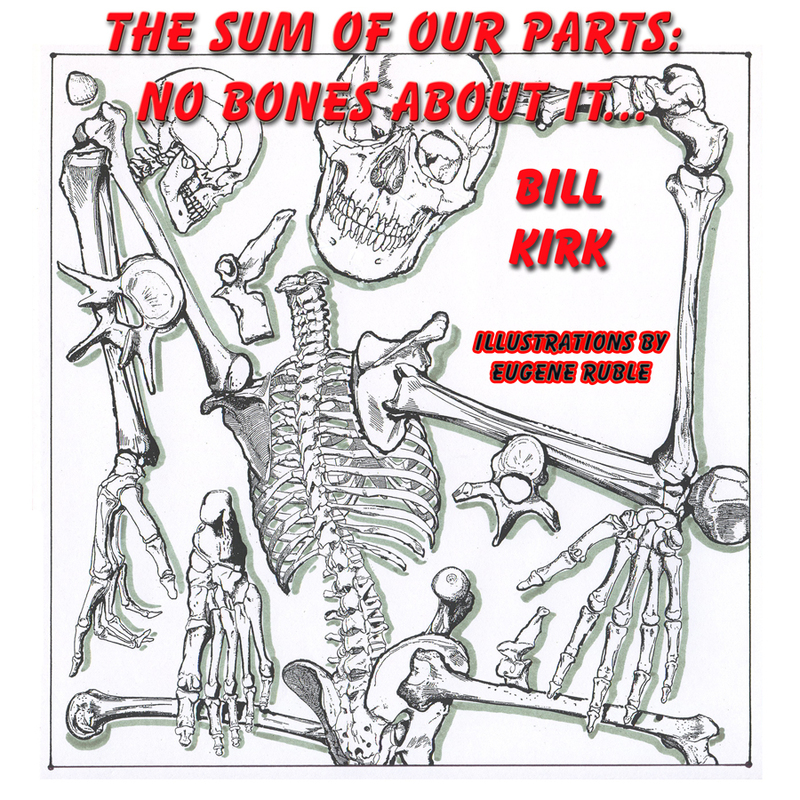 No Bones About It… is just one in a series of The Sum of Our Parts books by Bill Kirk. Listing bones from bottom to top and learning their names and what they do becomes easier with Kirk’s witty rhymes; and when put together with the superb illustrations by Eugene Ruble, you’ve got a real winner. Each page includes factoids about bones: the long and the short ones, the flat and the irregular ones. Kids learn which bone is the longest and which is the shortest. How many bones are in each hand? Your son or daughter will be able to tell you after reading No Bones About It… There’s also a neat mystery bones quiz that asks readers to identify the pictures of bones found on each page of the book. Learning just doesn’t get any more fun than this!